Creative instincts can be great... can get you into trouble... and open doors, or in this case a pot lid. We lived in all 4 corners of the US (CONUS). We savored some great taste sensations. We learned to like produce, fish, fruits that we not on our plates as children. Some were fantastic and some... we just couldn't invite back again! Legumes (any sort of dried bean or pea) are just not my friends! And on that no fly list in capital letters, is okra. Tried it, and believe we are incompatible. Both Dale and I can live with that. But then there is gumbo. I love the idea. I hate picking out the okra. So, I tried it without. I have had successful without recipes (Superbowl Chili). And voila, another! 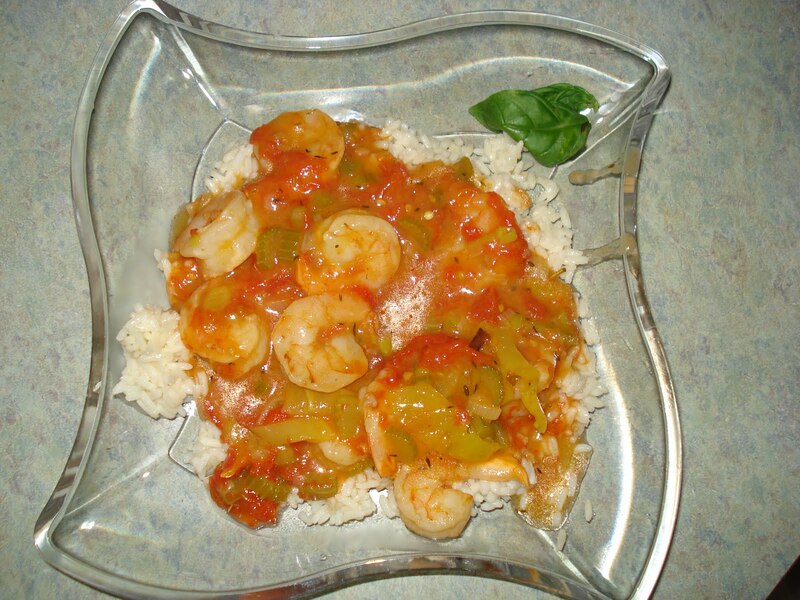 Spicy succulent shrimp in homegrown tomato based sauce is a winner. Give it a try. Heat a Dutch oven over medium-high heat. Cook the flour for 2 minutes, or until golden, stirring constantly to prevent scorching. Pour the flour into a small bowl. This is an important step, as it adds flavor to the gumbo. Stir in tomatoes and thyme, parsley and basil. Add broth reserve 1/2 cup. Stir the remaining broth into browned flour to make a paste. Add to tomato mixture, stir until blended. Bring to a boil. Reduce heat and simmer, covered for 30 minutes. Stir in shrimp. Simmer for 5 minutes. Remove from heat. Stir in Frank's hot sauce and salt. Let stand, covered for 30 minutes. 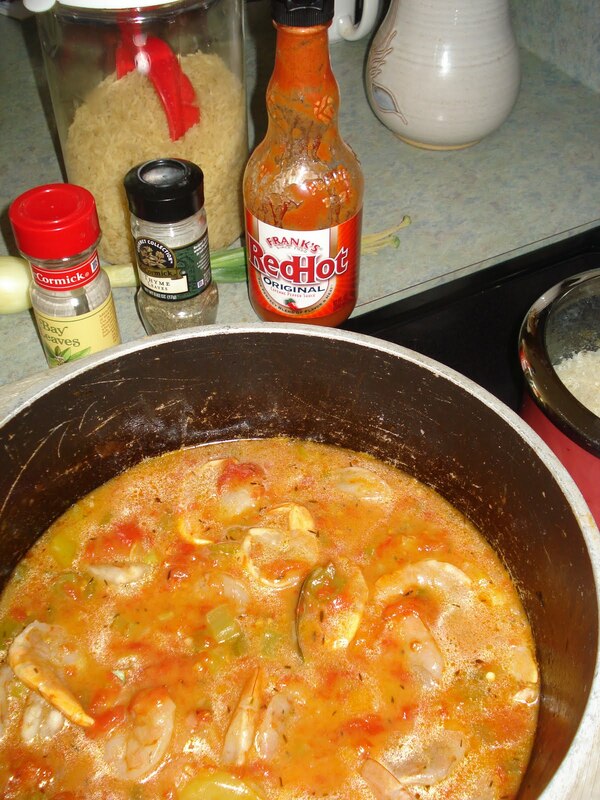 To serve, reheat the gumbo over low heat if necessary. Spoon the rice into bowls. Ladle the gumbo over the rice. A classic recipe can take on diverse tastes with simple substitutions and deletions! We enjoyed this, and will cook it again... as long as there is fresh shrimp available. You said dutch oven! ha ha Love your blogs.